7-Seater ertiga provide cheapest options of SUV car rental and having very high demand in Local and outstation rental. Ertiga can be rented for business trip with 4-5 team members, Meeting of delegates or family holiday trip for outstation as well. The Ertiga rental is cheapest in the segment of SUV car rental of 7 seater segment with good performance and multiple fuel options available. We provide Ertiga CNG for city ride with less pollution and minimial Carbon footprint while for outstation route where CNG not available easily we provides Ertoiga Diesel option. Ertiga provides layout of 6+1 with carrier on top for luggage and ample boot space of more than 120 Ltr. You can book your Ertiga Rental trip online or by using Mobile app. Some of the Polular city where ertiga available for services is more than 65+ cities for corporate services and almost 600+ cities for Local Travel and Outstation destination cities. 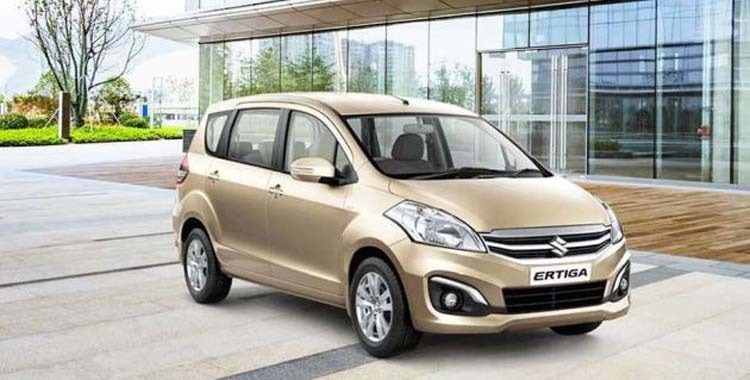 The Popular cities rental of ertiga start from Rs. 15 per Km onwards. Hire ertiga in Delhi, Hire Ertiga in Mumbai, Get ertiga rental in Bangluru, Ertiga for outstation rental , Delhi to Jaipur ertiga Trip, Delhi to Agra Ertiga rental, Delhi to Manali Ertiga Rental, Delhi to Ajmer Ertiga rental, Delhi to Jodhpur Ertiga Rental, Rent ertiga for Delhi to Chandigarh, Delhi to Amritsar Ertiga Rental. Ertiga Rental for Delhi to Manali, Delhi to Nainital Car rental ertiga, Delhi to Mussurrie Car rental ertiga, Ertiga for Delhi to Rishikesh, One way car rental from Delhi to Dehradoon, Ertiga Rental from Delhi to Haridwar, Delhi to Khatu SHyamjee Ertiga Car rental are some of the post popular trip that we are keep receiving each day. We are having more than 1500+ ertiga in services in all those cities and provide best possible options for the outstation car rental and local sightseeing package for ertiga. Cablo Provides ertiga 6+1 commercial vehicle rentals in more than 65+ cities from where you can book your 7-seater Ertiga SUV to visit and explore almost 680+ cities all over India. You can hire 7 Seater Ertiga from cablo for outstation rentals, Daily employee movements within City limit, Shuttle services for your multi city , multi pick up and drop services for employee, Meeting Incentive and Conference for your employee within the given location, Holiday trip with family and group members. There is so many cheap ertiga rental service might be available in your market, then why you will use the expansive Ertiga rental for outstation services from cablo is one of the biggest questions that suddenly keep coming in mind while checking the prices at cablo website or cablo app for outstation booking. Fleet – we have more than 800+ tempo Travellers in our fleet of Network with 1250+ 6+1 7 Seater Ertiga SUV at your services round the clock. All these Ertiga SUV car are verified and audited for quality on regular frequency to maintain best quality and comfort. We provide less than 5 years older vehicle only and any vehicle that is more than 5 years older is not running on our network at all. Guide on Request – Cablo 7-seater Ertiga rental for outstation rental is not just a vehicle rental scheme. This is full holiday travel planning as well, so in the case you need trained and government verified Local guide for your city tour with translator, we are able to provide those services as well. Hence this way didn’t need to go to any other place to look for anything within your entire tour plan and trip managements.